By Macaroni - Polly Agnes by The Cure. During her long life Lily Agnes was a great racemare, and an even finer broodmare. Her mother, Polly Agnes, was a product of the famed Sledmere Stud, but she had been such a tiny and weak foal, that Sir Tatton Sykes, the owner of the stud, gave her to his stud groom, James Snarry. 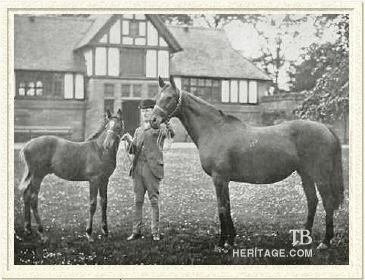 The catch was that Sir Tatton wanted the scrawny filly removed immediately from his property. Little Polly Agnes was kept as a broodmare by her new owner, and he sent her to Macaroni, a Derby winner. The result was Lily Agnes. Not much was expected of Lily Agnes as a racer, described as a "...light-fleshed, ragged-hipped, lop-eared filly." During her turf career she developed into a roarer, but that did not prevent her from winning. In training from two through the age of five, she won 19 races at distances ranging from five furlongs to three miles. Among the races she captured were the Northumberland Plate, the Great Ebor Handicap, and the Doncaster Cup. Snarry was ambitious when it came to finding a mate for his prize filly when it came time to send her to the breeding shed, and booked her to the Derby winner Doncaster, standing at the Duke of Westminster's Eaton Stud. Eaton stud manager Richard Chapman later recollected, "Lily Agnes, when the property of Mr. Snarry, of Malton, came here on a visit to Doncaster. I liked her so much that I urged the Duke to buy her. His Grace had not, however, made up his mind to adopt my suggestion by the time the mare was ready to go back home; but a few weeks later he sent me to Malton to examine and report upon her. Eventually the Duke decided to buy her, but he made the stipulation with Snarry that nobody, apart from themselves, should know how much he had paid. It was not until after Ormonde had won the St. Leger that I learned that the Duke gave for Lily Agnes £2500 and two free subscriptions to Bend Or, whose fee was then 200 guineas. The Duke afterwards bought Lizzie Agnes, sister to Lily Agnes, and dam of Orwell (third to Sainfoin in the Derby)." The price for Lily Agnes proved a bargain for the Duke. Lily Agnes foaled a colt by Doncaster named Rossington, for Snarry, and then, for the Duke, to the cover of Doncaster, she produced a filly. Named Farewell, she later captured the One Thousand Guineas. Mated next to Bend Or, Lily Agnes produced the Duke's unbeaten Triple Crown champion, Ormonde, considered one of the great racehorses of all time. Subsequent matings with Bend Or yielded the fine colt Ossory, winner of the St. James Palace Stakes and the Prince of Wales Stakes, and the filly Fleur de Lys, winner of the Kempton Park Champion Nursery Handicap. In 1887 came Ornament, badly beaten in her only racetrack appearance, but the dam of the immortal Sceptre, winner of every classic race of 1902, except the Derby. Lily Agnes was a roarer, and it is believed she passed this wind infirmity on to many of her offspring. Certainly Ormonde was affected, as he developed breathing problems prior to his four year old season. 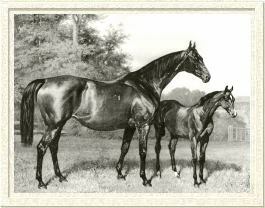 Lily Agnes had no more recorded foals after the birth of a colt named Orelio in 1894. She died in 1899 at the age of 28, and was buried at Eaton. That same year, two of her celebrated paddock mates also died -- Shotover and Angelica, the dam of Orme. 1899 also saw the death of the Duke of Westminster himself. It was the end of an era.